For the fourth time, the LogDynamics research cluster is organizing a summer school that brings together young scientists from the field of logistics. LOGISS 2018 will take place at the University of Bremen from July 22nd to 26th, 2019. In addition to diverse lectures by renowned international scientists, the participants will also be offered lab sessions, field excursions and social events. The theme of this year's Summer School is: Digitalization in logistics. LOGISS pursues the goal of establishing a network of young scientists in the field of logistics that promotes innovative ideas from various disciplines and enables new opportunities and joint research. The target group are master's and doctoral students with research topics at the interface of logistics, information technology, industrial engineering or related disciplines. On the occasion of the Supply Chain Day on April 11th 2019, the Mittelstand 4.0-Kompetenzzentrum Bremen, together with the BIBA – Bremer Institut für Produktion und Logistik GmbH and the LogDynamics research cluster, is organizing an innovation workshop on digital logistics. We offer an exciting program with practical presentations and demonstrations of the latest research results on the topics of digital communication, digital service, digital transport and handling and digital products. In this workshop, you will have the opportunity to identify the potential of digitalization for your company and discuss the opportunities and challenges with experts from industry and research. Get to know digital logistics and let yourself be inspired! The Hannover Messe is the world's leading trade fair for industrial production and shows a wide range of areas from research and development, industrial automation and IT to supply, production technologies and services to energy and mobility technologies. Together with its partner WSN Technologies AG from Braunschweig, BIBA - Bremer Institut für Produktion und Logistik is presenting an innovative IoT assistance system for intralogistics (LoRaLight), which enables pick-by-light picking with minimal installation effort and great adaptability. BIBA will also provide information on the STRATUS cooperation network, which focuses on the development of intelligent work systems using machine learning technologies. We look forward to welcoming you at our joint booth of Lower Saxony, booth D05 in Hall 5. "The Digital Now" is a series of events offered in cooperation with the Mittelstand 4.0-Kompetenzzentrum Bremen, the Interessenverband bremen digitalmedia and the Senator for Economic Affairs, Labor and Ports. In February, "The Digital Now" will be hosted by BIBA - Bremer Institut für Produktion und Logistik GmbH. There you will have the chance to experience first-hand how digitalization changes processes in production and logistics and how your company can profit from the innovations. Look forward to exciting demonstrations and let yourself be digitally inspired. Get to know an autonomous assistance system to support human-machine collaboration in assembly processes. Learn how sensors can support the loading of components and how they bring transparency to your supply chain processes. BIBA is looking forward to your visit! Innovation Warm-Up - Bootcamp Coaching - An Approach for Your Company? The digitalization of the economy creates new opportunities for companies to become better. Which technologies can be used? How can we become even more valuable for our customers? New ideas have to be developed and tested together with the users. Pioneering companies are real experimental factories in which ideas are developed and implemented in series. Do you also want to tackle and implement? We are looking for entrepreneurs who really want to make a difference. On 16th of November 2018 we will invite you to the Bremen Climbing Centre and the BIBA and show you ways of doing so: contentwise in workshops, physically in a joint climbing session. What awaits you? Three hours full of impulses! 4. A decision: Bootcamp - Personal Training for your company. The event is organized by Mittelstand 4.0-Kompetenzzentrum Bremen and SALT AND PEPPER Holding GmbH & Co. KG. It is limited to 30 participating companies. The Mittelstand 4.0-Kompetenzzentrum Bremen cordially invites you to an Open Day. On 1st of November from 9:00 a.m. you can inform yourself about practice-oriented applications and exchange ideas with other entrepreneurs and with us about the latest trends over drinks and finger food. Find out at first hand what specific offers and support options the Mittelstand 4.0-Kompetenzzentrum Bremen has in store for SMEs. Experience the technologies and tools of digitalization up close with our practical demonstrators and exhibits. Seize the opportunity to make an appointment for our free digitalization check on site. The partners of the Mittelstand 4.0-Kompetenzzentrum Bremen will be available to answer all visitors' questions. On October 23, the Institute of Shipping Economics and Logistics invites to the ISL Maritime Conference 2018 in Bremen and continues its traditional series of events. As in previous years, the participants can expect exciting lectures, discussions and forecasts on the current situation and perspectives of the global maritime industries. The speakers from business, science and politics will focus on digitalization and industry 4.0 in the maritime economy, its potential for maritime SMEs, as well as the development of shipping markets, ports and their hinterland. Let yourself be inspired to take your first steps on the way to digitalization in the subject area "Digital Transfer" by lectures and discussions. We are pleased to welcome you to the ISL Maritime Conference 2018 at "Schuppen 2" in the Überseestadt in Bremen together with this year's cooperation partner - the Mittelstand 4.0-Kompetenzzentrum Bremen. The German Supply Chain Congress is one of Europe's most important event about logistics and supply chain management. Here, leading thinkers and logistics experts share knowledge and suggestions, as well as discuss recent and future issues. An important part from the start of congress is its ability to be a common ground for networking and future business opportunities. The research cluster LogDynamics is again taking part in the parallel exhibition. Following the 35th congress' motto "Digital Meets Real", our presence is in the sign of digitalization. Our focus areas will be: digital communication, digital service, digital transport, digital product and digital transhipment. We would like to invite all congress participants to visit us at the LogDynamics booth PV/23. The digitalization of the economy is taking place inexorably and at an ever-increasing pace. If you want to be successful in the future, you have to meet the diverse requirements and use the resulting opportunities to create value. This is where the format of the event of the Mittelstand 4.0-Kompetenzzentrum Bremen, in which BIBA is involved, ties in. Companies are being prepared for the new digital world in a unique workshop, learn methods and tools for developing new strategies and can apply them after a short time. Use the DISS method to familiarize yourself with pragmatic approaches and tools for a digital transformation process and try them out immediately after. Target groups are managers and project managers of small and medium-sized enterprises who want to prepare their companies for the challenges of digitalization. The increasing complexity and growing dynamics of digitalization require an increasing agility of the organizations and thus also of their managers. Traditional organisational and management tools are increasingly reaching their limits and companies are facing new challenges to their management systems. The workshop of the Mittelstand 4.0-Kompetenzzentrum Bremen, in which BIBA is involved, establishes the connection between agility and digitalization and shows how an agile management style on the way to digitalization leads to success. Learn how you can orientate yourself in the complex field of "Leadership Agility". Get to know practical models and tools that can serve as suggestions for your own organizational development. Target group are managers and project managers of small and medium-sized companies, especially those who want to develop from conventional leadership to agile leadership in order to arm their organization for the digital world. As a result of digital change, companies are constantly facing new challenges that have to be overcome in a sustainable manner. In the first event of "The Digital Now" series, we would like to talk to you about current and future cyber threats and how they can affect your daily business processes. During a live hacking we demonstrate how easy it is for cybercriminals to infiltrate other IT systems. During the subsequent get-together, interesting contacts can be made and new impulses for one's own work can arise. "The Digital Now" is a series of events offered in cooperation with the Mittelstand 4.0-Kompetenzzentrum Bremen, the bremen digitalmedia interest group and the Senator for Economics, Labour and Ports. With this series we would like to invite small and medium-sized enterprises in particular to engage with various topics of digitization and to further educate themselves in dialogue with experts from practice. The BIBA factory of expertise on "Autonomous Control in Production und Logistics" offers courses specifically for small and medium-sized companies to help them on their way toward the digital future. This training course applies to small and medium-sized enterprises in Germany and is held in German. After the success of the 1st workshop, the MARSAT project partners cordially invite you to the 2nd MARSAT Workshop on Thursday, 6 September 2018, 14.00 - 16.00 at the SMM Maritime Trade Fair in Hamburg, Germany. MARSAT, a network of four companies and a research institute, develops new innovative services to increase efficiency, safety and cost saving for the maritime industry based on satellite data services. These services include, amongst others, the optimization of ship routes, daily ice services or seabed and bathymetry mapping. Alongside shipping, the offshore industry and emergency and rescue services will also benefit from the new services. This workshop will provide again an excellent platform to discuss challenges and solutions for the maritime industry in the digital era with a strong focus on the contribution of modern satellite capabilities (Earth Observation), modeling services and data flows. The final results of MarSat, a 2.5 years research project, will also be showcased. The SMM is the leading international trade fair for the maritime industry. From 4th -7th September 2018, all well-known representatives of the shipbuilding and shipbuilding-supply industry as well as experts from all over the world will meet in Hamburg to find out about innovations, forward-looking technologies and current trends in the field of digitalization. The LogDynamics also presents itself with the Mittelstand 4.0-Kompetenzzentrum Bremen at the joint booth of the State of Bremen in Hall B7, Booth No. 130. The aim of the Bremen Competence Center is to promote small and medium-sized enterprises (SMEs) in their degree of digitalization as well as to increase the latter through individual support measures. The International Conference on System-Integrated Intelligence, which is co-organized by LogDynamics for the fourth time already, provides a forum for academia and industry to disseminate their latest innovations and practices. The focus is set on integration of new, intelligent functionalities into materials, components, systems and products to enable future technologies with enhanced capabilities. The participants have the opportunity to benefit from impulses on various topics concerning the future of machines, products and manufacturing as well as get an insight into cutting-edge machine tool technology through an experimental shop floor tour. Complemented by a dinner, the conference will provide abundant opportunities for vibrant discussions and networking. Experts around the world are responsible for sensitive and, in most cases, high quality cargo. The experts have for years a recognized industry meeting: the conference and exhibition "BreakBulk", which has been held since 2006 in Antwerp. From the 29th to the 31st of May 2018 the fair will be held in Bremen for the first time. The research cluster LogDynamics participates in the international industry event as a co-exhibitor at the booth of the Bremen ports. A total of 29 co-exhibitors from the region will be present at the 192 m2 booth. We look forward to your visit in the hall 5! Also this year, the research association LogDynamics is organizing an event on the occasion of the Day of Logistics together with the BIBA - BIBA - Bremer Institut für Produktion und Logistik and the Mittelstand 4.0 Kompetenzzentrum. Under the motto "Future of Logistics", the topic of digitalization will be the focus. The following aspects are discussed within the framework of a World Café: digital communication, digital service, digital traffic and transshipment as well as digital product. This is followed by a get-together. The Mittelstand 4.0-Kompetenzzentrum Bremen supports small and medium companies in their degree of digitalization in order to increase it through selective measures. The kick-off-event will take place on 9th April in the BIBA hall. Participants will have the opportunity to get inspiration through exciting Best-Practice-examples from the Bremen innovation clusters for their own consideration of digitalization as well as to experience the thematic foci of the 4.0-Kompetenzzentrum Bremen via Live Demos. The subsequent Get-together will serve as a good opportunity for continuing conversations as well for networking. The sixth event of the LogDynamics conference series will be held at the University of Bremen from 20th to 22nd of February 2018. The conference addresses scientists in logistics, operations research, production engineering, and computer science and aims at bringing together researchers and practitioners interested in dynamics in logistics. The LDIC provides a platform for discussion of advances in the areas of dynamical aspects of logistic processes and networks. The spectrum of topics reaches from modeling, planning and control of processes over supply chain management and maritime logistics to innovative technologies and robotic applications for cyber-physical production and logistic systems. In Bremen gibt es ein neues Hackathon Format. Auf diesem Hackathon wird die Entwickler-Community vom 16.2 bis zum 18.2 aus der Region demonstrieren, was sich in 48 Stunden von der Idee bis zur prototypischen Implementierung in kleinen Teams umsetzen lässt. Das BIBA ist Netzwerkpartner dieses spannenden Events.EntwicklerInnen, egal ob Student, Wissenschaftler oder Praktiker, entdecken, was die von Partnern bereitgestellten Plattformen und Ökosysteme zu bieten haben und liefern kreative und spannende Umsetzungsideen für vernetzte Produkte, Apps und Services. Dabei liegt der Fokus des Hackathon Bremen auf B2B-Anwendungen im Kontext von Industrie 4.0. 11th International Conference on Software, Knowledge, Information Management & Applications (SKIMA 2017) is going to be held from 06 to 08 December 2017 in Colombo, Sri Lanka. The conference aims to bring together researchers and experts in Knowledge Management, Software Engineering and Information Systems to share their ideas, experiences and insights. We welcome researchers and practitioners from academia, industries, research institutions, R&D enterprise services and governmental organisations to exchange innovative contributions around the conference topics. In the scope of the 'Mittelstand 4.0-Kompetenzzentrum ‘Mit uns digital! Das Zentrum für Niedersachsen und Bremen' (Industry 4.0 competence centre for small and medium-sized enterprises), BIBA - Bremer Institut für Produktion und Logistik develops an expert factory for ‘autonomous control in production and logistics’. Here, demonstrators, dialogues and training courses on digital production and logistics are offered (free of charge) to small and medium-sized companies. The training courses shall qualify specialists and executives regarding the future concept Industry 4.0 and support cyber-physical systems in the respective company. Three core topics in the context of Industry 4.0 are covered: mobile technologies and smart products, efficient planning and control of logistic processes and technical systems as well as adaptive systems for a changing environment. The next training course will be held at the following date: November 20, 2017. ‘Mit uns digital! Das Zentrum für Niedersachsen und Bremen’ is coordinated by the Hannover Centre for Production Technology and has started at the beginning of 2016 as the first 'Mittelstand 4.0-Kompetenzzentrum' in Germany. This year again the research cluster LogDynamics is part of this important forum by participating in the accompanying exhibition. We would like to invite all congress visitors interested in innovative solutions for logistics to visit us at the LogDynamics booth PV / 05. The key aspects of this year's presence are: methods and technologies for the realization of industry 4.0 applications as well as digital services and new business models in logistics. The conference is organised by the IFIP working group 5.7, which was established in 1978. It is one of the leading international conferences on Production Management. This year, the Hamburg University of Technology, the TU Chemnitz and the University of Bremen (LogDynamics) are responsible for the organisation. The APMS 2017 will take place in Hamburg. This year’s topic is: Shaping the future of production management – the path to intelligent, collaborative and sustainable manufacturing. The Chamber of Commerce of Bremen and Bremerhaven as well as the Oldenburg Chamber of Commerce invite entrepreneurs to an event as part of the "Industry meets Science" series, which will be hosted by the BIBA - Bremer Institut für Produktion und Logistik and the Research Cluster LogDynamics of the University of Bremen. The event advocates itself to connect industry representatives and scientists and encourage cooperations. It will feature an interesting program with presentations and demonstrations of the newest research outcomes about the topic of digitalization in production and logistics. The event starts with keynote addresses from Industry and Science, which provide exemplary solutions for practical issues of digitalization. Afterwards you are able to inspect the newest developments in BIBA and LogDynamics. You are welcome to look forward to fascinating demonstrations about industry 4.0, robotics in production and logistics, new business models as well as augmented reality and virtual reality technologies. Finally a get-together offers a platform for further discussion and networking. LogDynamics is carrying out on the edge logistics research both related to basic concepts in logistics as well as in the applied area. A main aspect of the work is to strengthen the collaboration between the research and the logistics industry in the region of Bremen as well as in an international context. Thus, since years we have had a very fruitful collaboration with bremenports and VIA BREMEN with several common activities strengthening this research-industry relationship. As a part of this collaboration, LogDynamics will again be part of the common booth Bremen / Bremerhaven on transport logistic 2017. transport logistic is one of the largest fairs targeting all different stakeholders within the transport and logistics sector regarding mobility, SCM, IT solutions and related areas. LogDynamics presents the latest developments related to the field of digitalisation in the logistics and cellular conveying technology. On the occasion of the "Day of Logistics" LogDynamics organizes an event titled "Digital Services in Logistics" on 27th of April 2017. The co-organizers are: the BIBA institute, the association AFSMI, BHV, Chamber of Commerce Bremen, and WFB – Bremen Economic Development Agency. The event focuses on cooperation between science and economy as well as the transfer of research results in practice. The aim is to show the potential of digitalization and digital services in the logistics with exemplary applications and successful cooperation. A diversified program is offered with lectures, demonstrations of new research results, an exhibition with the involvement of our cooperation partners, and a concluding get-together. Industry Symposium "Logistics for the Wind Energy"
The wind energy sector on sea (Offshore) and on land (Onshore) is confronted with the task of cutting expenses in the production of electricity. Substantial efficiency potential lays in a lifecycle crossing view and an optimisation of the whole supply chain – from the product development over the transportation to the recycling. The term “wind energy logistics” combines different concepts, processes and technologies that provide a crucial contribution to this goal. The industry symposium “Logistics for Wind Energy – Challenges and Solutions for Modern Wind Plants“ brings together important stakeholders and research facilities of the sector. Task and approaches to logistic question marks along the lifecycle and the successful dealing with elements of uncertainty (wind, weather, gearbox failure etc.) along the supply chain are being discussed. This Brazilian-German Collaborative Research Initiative on Manufacturing Technology is a framework program to fund and support collaborative projects between German and Brazilian research groups in the field of advanced manufacturing technologies. The main goal of BRAGECRIM projects is to generate fundamental technological knowledge, enabling the development of innovative solutions for improving productivity, quality and sustainability of both German and Brazilian industrial companies. Another important goal is the knowledge exchange through work and study missions of researchers and students of both countries. The 8th annual BRAGECRIM meeting 2016 brings together the Brazilian and German researchers of the joint BRAGECRIM projects as well as members of the funding bodies DFG and CAPES and interested industry participants. The Institute of Shipping Economics and Logistics invites to the ISL Maritime Conference 2016 together with this years’ cooperation partners, the Maritime Cluster Northern Germany and the Bremer Senator für Wirtschaft, Arbeit und Häfen. As in previous years, the up to 150 participants can expect interesting lectures, discussions and prognoses concerning the current situation and perspectives of the global maritime industry. In this years’ focus of speakers from economy, science and politics are the sustainability in maritime economy as well as the development of shipping markets, harbours and the hinterland. A basic and underlying thought of the International Supply Chain Conference is to spread logistic knowledge between experts with corresponding publicity work and for a wider range of people as well. From the start, the congress has been intended to be a decisive platform for contacts and businesses. No other event in Germany makes the 'logistics market' more concrete than the International Supply Chain Conference. Since 1985 it is held in conjunction with a special exhibition. During all the years, the number of booths increased tenfold from 20 to recently 200. Additionally, there is a wide range of meetings and company meetings. Today, the International Supply Chain Conference is the most important annual logistics event in Europe. It has turned out to be a central meeting point of German economy. But also more foreign guests take part every year to profit from knowledge exchange and concentrated communication possibilities. The LogDynamics Research Cluster will be represented at a booth at the 33rd International Supply Chain Conference again this year. We cordially invite all congress participants, who are interested in innovative solutions for logistics, to visit our booth. The focus of this year's presence will be set on technologies for the realization of Industry 4.0. Already for the sixth time, the international RFID journal "RFID im Blick" invites to the two-day specialist congress in Düsseldorf. RFID tomorrow is the meeting point for hardware experts, system integration specialists and technology experts as well as decision makers of companies from almost every economic sector. Everybody, who wants to develop the future using RFID technology processes, is invited to exchange ideas in a dynamic atmosphere and to make valuable contacts. In 2016, the proven concept of RFID tomorrow consisting of Developer Day and User Day will not only be maintained in its core concept, but also expanded and developed. Once again this year, the Bremer Institut für Produktion und Logistik (BIBA) participates in the supporting exhibition. We present advisory services and training opportunities concerning Industry 4.0 in production and logistics. The International Conference on Dynamics in Logistics (LDIC 2016) is a biennial conference organised by the Bremen Research Cluster for Dynamics in Logistics since 2007. The conference addresses scientists in logistics, operations research, production engineering, and computer science and aims at bringing together researchers and practitioners interested in dynamics in logistics. The LDIC 2016 will provide a platform for discussion of advances in the areas of dynamical aspects of logistic processes and networks. The LDIC 2016 will be held in Bremen in conjunction with the IFAC MCPL 2016 (IFAC Management and Control of Production and Logistics). Furthermore, the LDIC 2016 and MCPL 2016 will be accompanied by several satellite events, including: Internet of Things (IoT) Workshop and LogDynamics Summer School (LOGISS 2016). Themed "A World in Motion" the 32nd International Supply Chain Conference will be held from 28th to 30th of October 2015 in Berlin. The research cluster LogDynamics and the BIBA - Bremer Institut für Produktion und Logistik will be represented with a booth at the accompanying exhibition - again jointly with VIA BREMEN. We cordially invite all congress participants, who are interested in innovative solutions for logistics, to visit us at booth 5 in the Pavilion (PV/05). The focus of this year's presence will be set on technologies for the realization of Industry 4.0. Already for the fifth time in a row the trade magazine "RFID im Blick" invites users, technology providers and all interested persons, who want to change RFID technology processes in the future, to the two-day trade congress in Düsseldorf. For the first time in 2015 five specialist fora with 8 to 10 lectures each will be offered. Topics are technology, industrial automation, logistics, maintenance, solutions in the field of access and safety as well as trade logistics and medicine. Once again, the research cluster LogDynamics and BIBA - Bremer Institut für Produktion und Logistik participate in the accompanying exhibition. The focus of this year's presence is the topic "intelligent load carrier management". In the presented project LaMa intelligent telematics and sensor solutions enable the monitoring of logistic objects in real-time. An increasing relevance of real-time management arises especially for high-quality and perishable goods. The concept of the "adaptable telematics" can increase transparency in logistic processes. The 4th Sino-German iCity Symposium will be held in the House of Science in Bremen on 21st and 22nd September 2015. Academic and industrial experts from China and Germany will gather to discuss issues on iCity Logistics, iCity Industry Development and iCity Criteria. Also young researchers of the International Graduate School (IGS) of Dynamics in Logistics will participate in the symposium. The Symposium is chaired by Professor Otthein Herzog from Jacobs University and University of Bremen, Professor Klaus-Dieter Thoben from BIBA and University of Bremen and Professor Pan Yunhe from Zhejinang University. It is hosted by acatech – National Academy of Science and Engineering and CAE – Chinese Academy of Engineerin and co-sponsored by University of Bremen, LogDynamics Research Cluster, BIBA - Bremer Institut für Produktion und Logistik, Jacobs University Bremen, Bremen Chamber of Commerce and Konfuzius Institute in Bremen. On 11th of July 2015 from 13h00 to 24h00 the University of Bremen invites all interested persons from Bremen and the surrounding region to an Open Campus. Under the motto "Opening Worlds - Sharing Knowledge" the university shows, what it is made of. In more than 30 pagodas, right in the middle of Campus-Park, faculties, institutes and central institutions give fascinating insights in their activities and projects. There is always something to discover in Campus-Park: scientific shows, science slam, international dance performances, original lectures and guided tours take turns. At 19h00 the big Open-Air-Party begins with three local bands as well as DJ-Team Elvis and Friends. LogDynamics and BIBA institute take part in Open Campus with two guided tours (13h30 and 14h30). The application and demonstration center LogDynamics Lab exemplarily presents research findings of innovative solutions in logistics. Among other things, visitors will see the factory of the autonomous products, the intelligent container and the parcel robot for autonomous loading and unloading. Furthermore, LogDynamics presents within the pagoda of the Faculty of Production Engineering, a segway equipped with RFID, as an example for innovations in logistics. The visitors learn about the driving experience on a test track in an entertaining way. We cordially invite you to join the event and to experience the university from another perspective. Special session "Sustainable connectivity management in logistic clusters"
The Asian-German Knowledge Network and Logistics (AGKN) organizes a special session on „Sustainable connectivity management in logistic clusters“ together with the Shipping Research Centre from The Hong Kong Polytechnic University. The University of Bremen is an institutional member of AGKN. The special session is conducted in the framework of Global Port Research Alliance on “Port and Logistics Connectivity”. The session is chaired by Prof. Dr. Hans-Dietrich Haasis and devoted to connectivity concept which has economic, social, and environmental dimensions, which bring people, goods, learning, resources, and capital closer together. The aim of the session to deepen the notion of connectivity for logistic clusters through interchange of different views on connectivity and the ways of its management in both industrialized and emerging economies. LogDynamics is carrying out on the edge logistics research both related to basic concepts in logistics as well as in the applied area. A main aspect of the work is to strengthen the collaboration between the research and the logistics industry in the region of Bremen as well as in an international context. Thus, since years we have had a very fruitful collaboration with VIA BREMEN (http://www.via-bremen.com/en/about-via-bremen) with several common activities strengthening this research-industry relationship. As a part of this collaboration, LogDynamics was a part of the VIA BREMEN booth on transport logistics 2015, that took place from May 5th to 8th, 2015. Transport Logistics is one of the largest fairs targeting all different stakeholders within the transport and logistics sector regarding mobility, SCM, IT solutions and related areas. LogDynamics presented the latest developments related to the field of IoT and CPS and presented the research project "Intelligent Container" (http://www.intelligentcontainer.com/en/consortium.html) which is an industry driven national project aiming at improving the quality of service within perishable food chains. Our participation on the booth led to interesting discussions concerning intelligent logistics solutions as well as several interesting new business contacts. 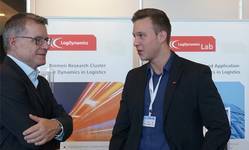 On 16th of April 2015 LogDynamics offered several attractions and future-oriented topics on the 8th nationwide "Day of Logistics", an initiative of Bundesvereinigung Logistik (BVL). In the BIBA research hall 11 companies and 12 research projects presented themselves. Under the motto "Innovations in Logistics" four lectures and a following Get-together completed the event, 200 guests participated. The event was co-organized by: Chamber of Commerce Bremen, VIA BREMEN and WFB - Bremen Economic Development Agency. Cooperation partners and exhibitors drew a positive balance. The guests praised the interesting program, the good setting for further conversations and networking as well as the unique chance to get in touch with innovations in logistics. The event MAPDRIVER Launching Event introduced the market analysis and the preliminary roadmap to foster the uptake of Information and Communication Technologies (ICT) in transport and logistics, including the results of the survey launched across Europe to assess the use of ICT in logistics and barriers for its implementation. Contributions from the European Commission and from project Partners were followed by a moderated workshop. The workshop aims at obtaining stakeholders opinion, feedback and further suggestions on how to foster ICT innovations thus optimizing the roadmap. Finally, the Roadmap supported European policy makers in decisions on future development of innovation policies. Therefore it is crucial that experts, leading companies and stakeholders participate in this future-oriented and policy-shaping think-tank process. This event took place on 27th of January 2015, 9:00 – 14:00 in Brussels (Avenue Livingstone 21). The project MAPDRIVER (http://www.mapdriver.eu) was funded under a pilot call launched by the European Commission to facilitate the uptake of innovations in Europe through demand-side innovation policies. MAPDRIVER targets specifically Information and Communication Technologies in transport and logistics and aims at developing a roadmap to foster the uptake of specific ICT technologies in this sector. The Institute of Shipping Economics and Logistics, the University of Bremen and China-ASEAN Research Institute at the Business School of Guangxi University jointly launch the 3rd international symposium on “Innovative Logistics Management” in November in Bremen, Germany. The thematic core of the symposium is sustainable and innovative solutions for efficient traffic systems and logistics processes in global supply chains. Organizers expect participation from local experts from China, Laos, Vietnam, Thailand, and Germany to discuss innovation-oriented solutions in line with the innovation strategy of each participating country. On 1st and 2nd of October, the Institute of Shipping Economics and Logistics invites to the ISL Maritime Conference 2014 in Bremen and continues its traditional convention series. As in previous years, the participants are expected to listen to exciting presentations, discussions and outlooks concerning the present state and perspectives of the global maritime sector. The focus of the referents from economy, science and politics is on the shipping market, the ports and the hinterland. The planned sessions are: “Changes in the Global Transport Markets I + II”, “New Business Models and Innovation in Maritime Logistics Processes” as well as “Influences of new Information and Communication Technologies to Maritime Logistics”. Furthermore, a panel discussion concerning the “Status and Perspectives of the Maritime Alliance” will be held. This year’s additional highlight is the 60th anniversary of the ISL. At the evening of the first conference day, the guests are invited for a reception of the Senate of the Free Hanseatic City of Bremen. It is already the fouth time in a row that the magazine “RFID im Blick“ invites users, technology providers, and all those who want to change processes using RFID in the future to visit the trade conference in Dusseldorf. What is new this year is that the conference will take place on two days. The first event day – September 29 – focuses on technological topics from the developer‘s point of view. An advisory board composes the lecture program innovatively and up-to-date, substantially addressing representatives from technology companies. The first event day is the Developer Day! Also this year the Bremen Research Cluster for Dynamics in Logistics (LogDynamics) and its member BIBA Institute will be represented within the trade exhibition demonstrating innovative solutions for the logistics sector. LogDynamics participates in the event "Welt der Logistik"
Themed “Mehr als Job und Karriere”, Welt der Logistik 2014, takes places on 25th of September. The research cluster LogDynamics participates in the exhibition and presents itself at a common booth with its member institutes BIBA and ISL. The conference provides a forum for academia and industry to present their latest research findings, innovations and practices in the field of system-integrated intelligence. It focuses on the integration of advanced functional capabilities into materials, systems, parts and products as an enabling technology for established application scenarios as well as new products and services. The perspective is highly interdisciplinary. The technological basis extends from new sensor technologies via material-integrated sensing and intelligence to aspects of communication and data evaluation. It includes the implementation of such approaches in autonomous decision-making, self-optimization and control in advanced engineering products and systems. Each year, the European Maritime Day welcomes Europe’s maritime community and policymakers to discuss, debate and exchange best practices. The 2014 Conference will be held in Bremen (Germany) on 19 and 20 May 2014 with a focus on innovation and maritime technologies. High-level sessions and stakeholder workshops, as well as exhibitions, public happenings and networking events will be organised. LogDynamics is participating in the accompanying exhibition and highlights the project Intelligent Container. The BIBA institute participates in the world leading trade fair for intralogistics CeMAT in Hannover. From 19th to 23rd of May in framework of the new CeMAT special exhibition “Innovative Logistic Solutions” the BIBA introduces two new systems. The special exhibition showcases live logistic chain and demonstrates how to integrate single solutions in complex processes. With several lectures the BIBA contributes also to the accompanying forum. The Research Cluster LogDynamics is participating in the exhibition of the 7th International Scientific Symposium on Logistics. This symposium is organized by the German Logistics Association (BVL) and will be held from 4th to 5th June 2014 in Köln. The leading theme is „ Logistics in the Networked Industry “. The fourth event of the LogDynamics conference series will be held at the University of Bremen from 10th to 14th of February 2014. The conference is concerned with the identification, analysis, and description of the dynamics of logistic processes and networks. The spectrum reaches from the modelling and planning of processes over innovative methods like autonomous control and knowledge management to new ICT technologies, mobile communication, and networking. Papers can be submitted until 30th of September 2013. The final results of the project "Intelligent Container" will be presented in a special session on the second workshop day. In total 9 contributions cover topics such as: Logistic Chain for meat and bananas, communication standards for freight supervision, logistic perspective (costs and benefits), air flow and ethylene measurement in containers. Cost management has become a critical success factor. Transparency about all direct and indirect costs is necessary along the entire value added chain. The concept of „total cost of ownership (TCO)“ is a holistically approach to identify cost-cutting potentials. Since 2006 the „Bremer Logistiktag“ has been the most important business conference in the field of logistics and supply chain management in North-West Germany. More than 500 participants and 20 exhibitors could be welcomed in 2011. In 2013, the event will be hosted by BVL International in cooperation with the KIESERLING foundation und VIA BREMEN. The theme “Total Cost of Ownership” will be addresses from different point of views. The target group are decision makers from the industry, trade and logistics service sectors. Experts from the region’s leading business sectors, e.g. shipbuilding, consumer goods, automotive, aeronautics and wind energy will introduce their concepts around the topic and show how to identify potentials and realize savings. The research cluster LogDynamics participates in the conference exchibition and presents itself at a common booth with its member institutes BIBA and ISL. Shipping Economics and Logistics will participate in the Bremen’s central event titled “More than Job and Career – Logistics make it possible!” again, organized by VIA BREMEN. presenting and debating on successful cluster policies and strong innovation systems supporting the exploitation of research results into the market. Manufacturing has undergone numerous changes that have been enabled by new technologies, different materials, and/or innovative product design. Building upon this relationship, this workshop will provide a forum to connect and inform people, to depict new trends, and to take a different view on manufacturing processes. The event will include a series of short presentations by experts from academia and industry, and the dissemination of existing tools to promote the innovation process. This workshop is part of an event series organized by the consortium of InnoMatNet (innomatnet.eu), a project funded by the European Commission. With the idea of bringing specialists from materials laboratories and innovation actors in various industrial sectors together, InnoMatNet aims to establish inter-disciplinary connections towards a successful innovation society. The first UAG (University Actions Group) meeting of the DASH7 Alliance will be held on 18th and 19th October 2012 in Ringhotel Munte am Stadtwald, Bremen, Germany. This international event features many researchers from Europe, USA and Asia, who come together to discuss the research progress in DASH7 technology. Renowned special guests talking on 6loWPAN, CoAP, Distributed Queuing and DASH7 in Logistics and more. The 29th German Logistics Congress of Bundesvereingung Logistik (BVL) themed " Networks of Excellence” will be held from 17th to 19th of October in Berlin. A fundamental idea behind the German Logistics Congress was and is to disseminate logistics knowledge of experts to the general public. Since 1985 the congress is also accompanied by a trade exhibition. Also this year the Bremen Research Cluster for Dynamics in Logistics will be represented within the trade exhibition demonstrating innovative solutions for the logistics sector. The highlight at this year’s stand is the model of a sea port terminal: autonomous cars in the transshipment process from the ramps of the vessel to the loading on the truck. During the whole process the vehicles will be traced with RFID-technology. Event messages will be sent to an IT-system and shared from there to all partners in the process chain. The demonstrator was developed within the RAN (RFID-based Automotive Network) project. The goal of the project is to create better transparency in the supply chain of the automotive industry. All interested participants of the conference are warmly invited to visit us at the LogDynamics booth number 22 in the Pavillon (PV/22). The second International Conference on Logistics and Maritime Systems will take place from 22nd to 24th August 2012 in Bremen. The objective is to provide a forum for exchanging ideas on the latest developments in the field of logistics and maritime systems among participants from universities and related industries, and to seek opportunities for collaboration among the participants. Logistics activities worldwide have been rapidly increasing. As a result, global freight networks are emerging which combine maritime transport, inland waterways and onshore road and rail transportation systems. The first conference of this series took place in Busan, Korea in 2010 integrating various predecessor conferences like the International Conference on Intelligent Logistics Systems (IILS), held in Busan, Korea (2005), Brisbane, Australia (2006), Kitakyushu, Japan (2007), Shanghai, China (2008), and Gold Coast, Australia (2009), and the Supply Chain Management (MLOG) conference held in Singapore (2008). The second InTraRegio consortium meeting took place in Bremen in August 21-24. The InTraRegio project is a coordination action funded within the “Regions of Knowledge” initiative of the EU 7th Framework Programme (FP7). The project started in January 2012 and will be implemented within 36 months. In conjunction to the Second International Conference on Logistics and Maritime Systems (LOGMS 2012) 35 participants of five clusters of the Canary Islands (ES), Bremen (DE), Marmara (TR), Calabria (IT) and Ruse (BG) met at the University of Bremen to discuss intermodality of freight transport systems, fostering of economic development and cluster capacity. LogDynamics is member of the consortium; it takes responsibility for the scientific issues. The Bremen region is furthermore represented by WFB and BLG Logistics Group covering respectively governance and industry. Those partners work on in-depth analysis of regional and cross-regional research agendas together with 15 partners from Bulgaria, Italy, Spain and Turkey. The next consortium meeting will take place in Brussels in November 2012. The Reseach Cluster LogDynamics is participating in the exhibition of the 6th International Scientific Symposium on Logistics, where it will be introducing the project "Intelligent Container". This symposium is organized by the BVL and will be held from 13. to 14. June 2012 in Hamburg. The leading theme is „Coordinated Autonomous Systems“. 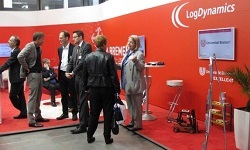 "Logistik verbindet" (Logistics connects) is the motto of the Logistics Day, which will take place on April 19th 2012, initiated by the Bundesvereinigung Logistik (BVL) e.V. Logistics Day intends to bring an insight to the public on developments in the logistics sector. VIA BREMEN organizes the Logistics Day together with a variety of notable actors in the port and logistic-center Bremen/Bremerhaven, as a central event with the motto "Logistik verbindet - Mitmachen lohnt sich!" (Logistics Connects - Participation Pays Off!). This event will take place from 10:00 to 16:00 in the BLG-Forum Speicher XI in Bremen. The Research Cluster LogDynamics participates with an own stand, where it will present, among other things, the Intelligent Container. On the occasion of the Logistics Day, the BIBA - Bremer Institut für Produktion und Logistik GmbH will be hosting an event themed „Innovations in Logistics“ in cooperation with the Chamber of Commerce Bremen and the WFB Bremen Economic Development on 14th of April 2011. As part of an interesting and varied programme, the economic and politic background in the Federal State of Bremen will be presented by the Minister for Economy Martin Günthner. Reputable speakers of the industry will report on innovations in logistics from their fields. An exhibition together with our cooperation partners, as well as the introduction of BIBA demonstrators will offer the opportunity of getting a further insight into innovative technologies and their fields of application. The following get-together offers an opportunity to professional discussions with logistics experts. All interested in logistics are welcome to participate in the event.